Posted on January 16, 2019 by Billy S.
Some form owners ask if it’s possible to send their forms through email for their recipients to complete. Instead of sending the actual link, the desire is to send the form in the body of the email message. Unfortunately, the short answer is no. The ability to email forms is not currently supported by most email clients. Online forms in general appear as a graphical front-end to a database and need an actual web page to run the needed parts. For example, Rules to show and hide elements, multiple pages, Calculations, etc. need to track and respond to user input. Email messages are simple text and basic HTML that are not able to perform these higher-level processes. In fact, many designers and email marketers know the struggle to design and develop email creative. Many styling and positioning techniques that seem simple are unusable in email creative. Does that mean there’s no way to use forms with email? Not exactly, no. It’s not possible to email forms and have recipients complete them from the email. The usual recommendation is to include the link to the form in the email message. This allows the email recipient to click the link and open the form in their browser as usual. Another possibility is to build the email using the Pre-populate link with images that simulate the form elements. This allows more interactivity in the email, while still linking to the form using the browser. Start by creating the form. 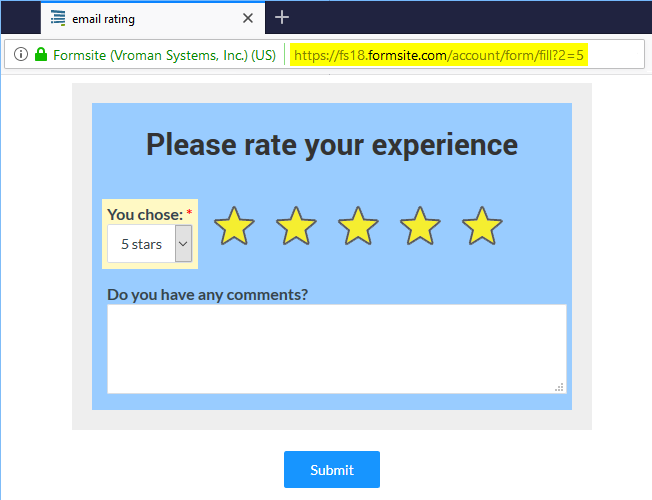 This example shows a survey with a 1-5 rating that the email links to. Once the form is complete, find the Pre-populate link on the Share page. Edit the Pre-populate URL in the browser until it loads the page with the first choice selected. Continue with the rest of the rating images, increasing the number for each. Send a test email and verify it’s working as expected. 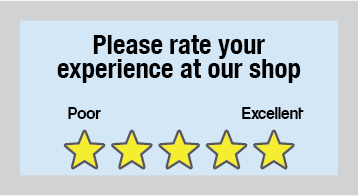 Clicking each star opens the form with that rating selected, then the user only needs to click the submit button to complete the survey.